movie summary: In the future humans will occupy space stations in an attempt to explore the outer reaches of space. The US Air Force has deployed one of it’s best pilots, Leo Davidson (Mark Wahlberg) to work with primates who fly unmanned probes into the stars. His best friend and top primate is called Pericles travels into a space storm and disappears from the scopes causing Leo to abandon all protocol to find his friend. When he enters into the storm he loses contact with the space station before crash landing on a planet called Ashlar in the year 5021. While exploring the jungle of the new planet, Leo comes across a group of muted humans that are hiding in the bushes. Before he can get any answers the group is kidnapped by apes on horseback. Shocked and confused, Leo is thrown into a jail where Ari (Helena Bonham Carter) takes an interest in this new rebellious creature. She buys him from slave owner Limbo (Paul Giamatti) who thinks she is crazy for taking a risk on such a creature. Thrown into the deal was the beautiful mute female named Daena (Estella Warren) and together the pair are forced to do chores at Ari’s father house. Senator Sandar (David Warner) has a whole army of human slaves which Leo plans to free, escape with, and launch an attack against the apes with. Ape army leader General Thade (Tim Roth) stops by for dinner and senses that Leo will be trouble his mannerisms and attitude towards apes. Colonel Attar (Michael Clarke Duncan) thinks the General is overacting to their new captures and tries to keep him calm. When Leo escapes with the humans, the General launches an all out assault team to capture them and prevent them from reaching Calima. This area has always been off-limits to the apes because it is the birthplace of their race and it is important to protect their history. Leo, Daena, Ari, Limbo, and the rest of the gang reach Calima, which actually is just the wreckage of Leo’s space station the Oberon. The General has led his troops to the desert and set up camp while he plans his attack. Leo heads into the wreckage to discover that it has little to no power capabilities, but is able to play the video history to tell the story of Oberon’s last days. The story of the apes coming to power is starting to make a little more sense, but Leo has no time to piece everything because the General is marching on the wreckage. He instructs his men to kill any human or ape that opposes his authority. Leo has to act quickly to use the wreckage as a shield and a weapon to save his new human friends while taking down the General at the same time. As the battle rages on, everything comes to a halt when a mysterious probe drops down from the sky that makes everyone put down their weapons and take a bow. my thoughts: Let’s take a moment to remember what life was like in 2001. Hollywood still had fresh ideas for movies, Mark Wahlberg wasn’t on steroids, and the term reboot or reimaging wasn’t applied to every new movie that came out. Tim Burton, after several successful movies, was given the green light to bring back the Planet of the Apes to showcase one of Hollywood’s most iconic franchises to a whole new generation of fans. Not having any prior knowledge of the five movies, TV shows, or books, I thought Planet of the Apes was really awesome when I went to see with my uncle in Boston. Fast forward ten years from that summer when Rise of the Planet of the Apes came out and my thoughts have since changed. This past summer I picked up Burton’s ape movie for $4 because I haven’t seen it in a long time. 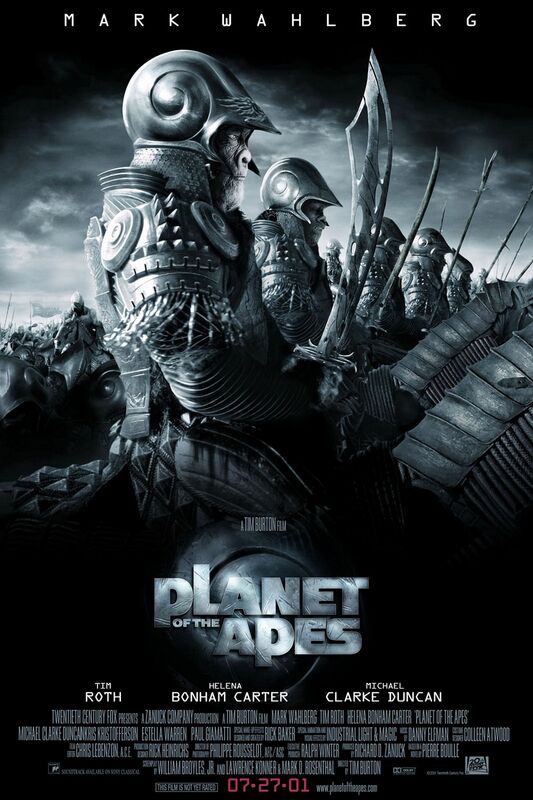 Looking back on this disaster of a film I have to come realise that the story, characters, or timelines make no sense what so ever compared to any other apes movie. On top of a story that has zero connections to Caesar and previous apes generations, the ending is a slap to the face of the audience. The movie ends (spoiler) back on present day earth where our hero is surrounded by apes who now control everything, much like how the whole movie plays out! They lead us to believe that there would be more conflicts and more battles to come only to retire the franchise yet again. I’m sure they had good reason considering how bad this movie bombed and Mark Wahlberg went on to bigger and better projects. Tim Burton has impressed me with a couple of movies through out his career, although apes wasn’t one of them. It’s hard to compare his movies and apes movies when watching Planet of the Apes from 2001 in 2014. The only part of the whole film worth watching, besides Mark Wahlberg saving the day, is the costumes. These actors and actresses did a fantastic job wearing real ape suits and wearing state of the art make up. Andy Serkis may walk around wearing a CGI suit, but a lot of credit needs to be given to Tim Roth, Helena Bonham Carter, Michael Clarke Duncan, and Paul Giamatti. These people were able to perform action scenes and stunts without the help of computers and deserved some sort of recognition, despite working with a below average script and storyline. It’s tough to sit here find positives in the story because it doesn’t seem at all possible. A human crash lands on a foreign planet, leads an uprising with like seven humans, then time travels back to his own planet to find the enemies he just defeated are still in power. The story doesn’t have a real ending and in an attempt to create a cliff hanger to get fans excited for a bright future, it just comes full circle back to the beginning. I feel like I am rambling about this movie but I feel at a loss of words to describe what I feel. I tried to watch it again a few weeks ago and put it to sleep, it was hard to get into after being spoiled with Caesar in Rise and Dawn of the Planet of the Apes. 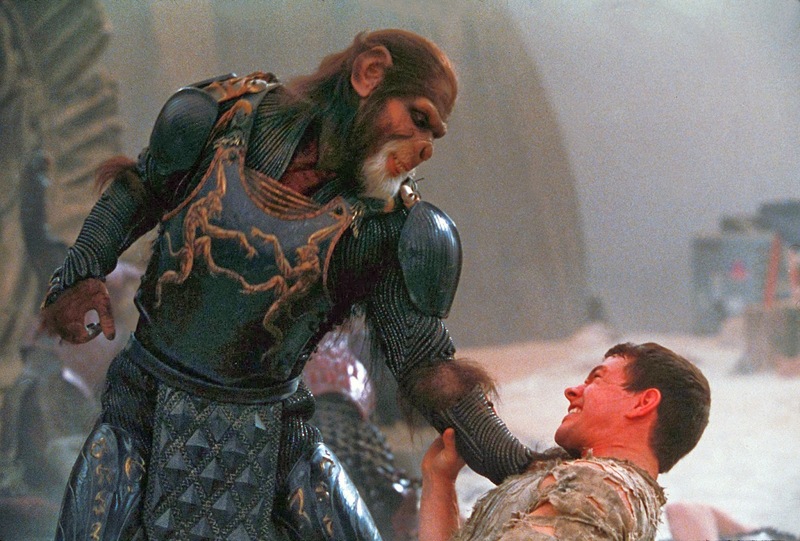 The whole fictional Semos is far from the leader we have come to expect to create a whole species of talking and fighting apes. In the original series, Caesar is a focal point in four out of five movies while Semos is barely talked about in this film because the main point is the power-hungry General Thade. He spends the whole movie trying to kill other apes and humans in attempt to become the most important ape ever. Blinded by this rage he’ll crumble to a rogue human with a limited skill set who ultimately wasted his time in the future only to end up in the same mess back on planet earth. my final thoughts: If you love the Planet of the Apes then you most likely have seen or own this movie. A young Mark Wahlberg helps carry some of the load of this Tim Burton script that is all about an angry ape seeking more power then he could ever handle. Unlike today’s CGI movies, the best part of this movie is the costumes and stunts which help you forget that this reboot ever happened. Pretty bad. Although, I guess it’s watchable. If anything. Good review Ryan. I will only keep it in my collection because I own all the other apes movies, other then that I would have recycled this by now ha ha. Thanks for the comment Dan! This film is shamefully awful.